With the coming of dawn's first light, the night watch gives way to the day. In supernatural communities, that has all kinds of mythological mores associated with it: the slinking away of the fox, the wolf vanishing into his den, the owl replaced by the dawn chorus as nocturnal becomes diurnal. Atop Kolvir, nightjars and owls flit to the woods to roost as jays bark a wake-up call. Magpies and crows, the occasional gull and pigeon and one or two ravens sit on a small copse of apple saplings high on the roof of the world, watching starlings and choughs, rooks and jackdaws mobbing in to gather on rock faces, around a small cluster of black robed, colourful robed and blue robed figures, their faces covered… and a Gryphon, purr'ting, clicking, hooting and cawing at the lot of them. The humanoids do not really respond, but the birds certainly do. Mixed mobs flock out, flock in, perhaps even a small detachment sent to watch a raven that is occasionally a man. Yes, the day's patrols begin. Among the roofs of Amber, a flock of mixed corvids, including Diaval in his raven form, wake (his gulls being notably absent as they stand out too much this far from the docks). As the birds and their designated leader become aware of the sounds of Amber stirring they become aware of the deep gryphon-sounds from the mount. There's no discussion, no order… Diaval simply takes to flight and the raven and crows immediately follow. A few moments later his choughs take note of this and take to wing as well, metaforicaly working their feathers off to catch up with the larger birds. Along the way, Diaval squacks out a request that the smaller birds save their energy and flit about the city to see if there is anything he'd want to be aware of and report at their leisure allowing the smaller birds to not have to overwork themselves. Within a few minutes, being able to literally take the 'as the crow flies' distance, the quartet of birds join the others at the top of Kolvir around the gryphon. As he alights on a nearby rock, Diaval says, "Good morning, Your Highness," to Carmichael in what sounds like his normal voice. Carmichael's ears prick, turning to the arriving corvid cluster. They might otherwise have simply been another wing of birds coming in to find out where they're scavenging and keeping an eye on today, but for that. The gryphon's beak clicks twice. "Good morning, Diaval, son of Random," not quite the exact same voice as when a human, as his chest is considerably deeper than as a human and it comes out more resonant. "I hear that congratulations are in order these days." - Turning to look at the cluster, some of the brightly clad and some black, white and shimmery peagreen-clad hooded individuals step forward to inspect the raven that talks. The raven that is Diaval bobs his head in a bird-like bow acknowledging the congratulations. "Thank you," he says. "I must correct your erroneous deduction however, Sky Prince, I am not Random's son. In truth, I am his grandson by his son Jarod." "Oh-ho! You'll be making him feel old," Carmichael notes with a dry chuckle, flicking his ears to chase away a pesky fly bothering him. One of the smaller jackdaws swoops and catches it, swishing along to land in the rookery of the apple sapling, cawing. "I know for myself, there's nothing quite like meeting a grandchild for the first time to drive such things as our lifespan home." He curls his tail around his haunches, the tip of it curling just -so-. "Do you feel you have found a place to be within Amber, with your innitiations and such?" "I feel like I am beginning to find a place," Diaval says. Noticing a nearby ant hill he hops over and flops down onto it. He rolls side to side agitating the insects and allows them to crawl over his body… he is "anting" as ravens are want to do in the wild. Allowing the insects to swarm him for a moment he adds, "The past few weeks I've been slipping away into shadow to explore my new abilities rather than spending much here in the city." Carmichael watches the behaviour with a keen eye, but little curiosity. He's been known to do such things himself, at times. Usually with wood-ant piles. A small mound is just not large enough to do much for a beast of his proportions. "There's a number of them. Many of us never really learn to do much more than the basics…" he observes, turning a head as the tallest and brawniest of the 'magpie' clad figures nearby draws close enough to crouch by the ant hill and diaval, staring at the raven with fierce, piercing eyes of a dried blood red hue, behind a facemask of light fabric. "Lieutenant Vyarr is curious, I think," he observes. Finishing his anting, Diaval hops up out of the ant hill and starts shaking ants off him. "Hello," he says to Vyarr in the language of the sky, sounding relaxed as he might if he was a human stoner having snacked on 'special' brownies or the like. Speaking in Thari, he asks, "Has he never seen a corvid anting before?" of Carmichael. "It is not that," Carmichael assures, as the hooded and masked figure looks back at him sharply at the sky-tongue and the thari that followed. The gryphon scratches his foreclaws on the ground, excising tiny furrows in the dry soil of the mountainside, back and forth as he looks on. "It is more that he knows of only three other sky folk that talk in the tongue other than their own." The figure hops like a crow a foot closer to Diaval and pulls the fabric mask from jaw leaning closer with fierce magpie eyes in a human face to look closely. 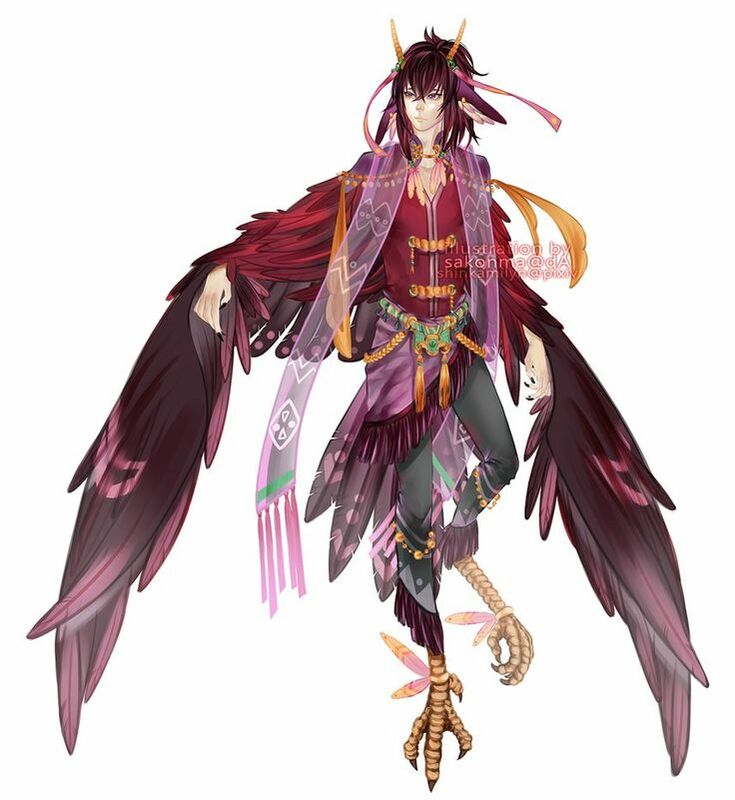 The harpy-like morrigu has plummage like that of a magpie also, with scars aplenty where feathers do not grow properly. "I understand," Diaval says in Thari with a nod. He then asks, as if whispering to his cousin so that it is shown that this is not meant to be offensive for Vyarr because even if he overhears the words they are only for the Prince, "Is he a harpy? Where I come from they are considered… intelligent pests by most." "No, not quite… close though," Carmichael replies in a murmur. Others in the 'colours of their clan' from straight black, to the jay-like colours of the bright-feathers, watch the Magpie morrigu investigating. Perhaps judiciously they learn by another being brave enough. "They are denizens of the path of blood — rather they didn't precisely have a home, until I swore to give them one in turn for their services. The place they came from, was destroyed, but they, for the most part, escaped and lived by travelling from battleground to battleground. Only one in a five hundred odd of them has the ability to travel through them though. They're called Morrigu." "Morrigu," Diaval repeats as if feeling out the sound of the word. He then says, to Vyarr, "It is a pleasure to meet you," and asks, so that either Carmichael of Vyarr can answer, "Would etiquette be best served by my allowing them to see my human form?" "We have sharp eyes," Vyarr replies in a voice that sounds rich with the nuances that go along with being able to immitate with great facility — "Vyarr, show Diaval your wings," Carmichael instructs, quietly, watching as the morrigu gives him a long look of red-brown eye and stretches 'arms' out, allowing the long middle, ring and pinky fingers with their extended bones to extend out from inside his billowing sleeves, with a flick of primaries coming with it. Two fingers and thumb serve as a hand, making them more humanoid than your average pesky harpy and perhaps in their minds, more noble as they do not smell foul, nor are they filthy. Carmichael murmurs. "That means yes, by the by," to the raven. "They talk rather metaphorically sometimes. Sharp eyes are keen to see." Diaval nods in bird form and then concentrates. His form blurs, shifting and growing from the large raven that stood there originally into his more than six-foot tall human form. He again bows, to Vyarr, and says to the Morrigu, "Again, greetings Lieutenant," showing with his expression that he is impressed with and acknowledges the differences between their kind and the primitive harpies of his home Shadow. "I am Vyarr, lieutenant of the guard, of the pied clan," Vyarr replies with a trill in his throat at the end of it, head held high. This one has speckles of black and white clay paint dappled on the plumage that can be seen outside of his light fabric clothing, breaking up the uniform nature of black, white and peagreen feathering further. All of the morrigu though, are staring hard and unblinking at Diaval, committing his appearance to memory. The gryphon churrs. "This one is like myself and like the lady Isobel. He wears blackfeather, where she wears killing shadow." "It is a pleasure to meet you, Vyarr," Diaval says to the Morrigu acknowledging the other's greeting and he nods in the general direction of the others of that kind. Then, after Carm's churr, he frowns with lack of understanding and turns to look at the prince and, with a change of expression, he asks for an explanation. "There are individuals similar to the Morrigu that I have yet to be able to befriend," Carmichael explains, looking to the hooded figures then Diaval with large golden-green eyes. "I expect you have come to realize in your explorations of your new abilities that belief and expectation has a hand in creating reality, but that possibilities are nearly endless by now?" The question is rhetoric, for no real reply is expected. "The morrigu are descended of humans and of, if what their shamans tell me is true… of a corvid-affilated deity. The royal house of their people are the purest of ravens; the blackfeather" indicating the black clad with a nod "…but over the centuries they diversified into other corvid species." Pausing, he looks over the morrigu, then back to his cousin once removed. "In other shadows, similar beings came into existence; the Garuda of Tanus, are similar but more avian. The harpies of legend of course, in one or another iteration. The Killing shadow is what they call the Shem-su Heru, servitors of Horus, a deity of some power from a shadow on the same southern parallel as Alhambra." As 'corvid-affiliated deity' is said the oft-reserved Diaval's features momentarily show surprise before he locks his reaction down and resumes his controlled expression. He nods along with the information and says a terse but polite, "Thanks," to Carmichael before directing his attention directly to Vyarr and his ilk. "Might I ask you the name of your divine ancestor, Lieutenant Vyarr?" he asks in a respectful tone of voice despite there also being a sense that he expects an unhesitating answer. Whether the gryphon finds offense there or not, his face and body language do not betray it, so the chances are strong that this is something he isn't phased by. Ears prick as his golden-green eyes settle on Vyarr. The Pied morrigu looks briefly at the black clads that stand nearby in their cloaks and masks, snorts lightly in their direction when there is no reply, as if mocking their bravery and replies. "Mr Roghain," which of course, as he says it, sounds to the untrained ear, a lot like 'Morrigan'. Diaval nods and raises a hand with one finger extended to Vyarr and his like and then asks Carmichael, decorum forgotten for the moment by thoughts racing though his mind, "Are gods often transShadow beings or should similarities always be considered coincidence rather than correlation?" "It depends on the god in question, to be honest. Some never learn to migrate. I have been plagued by one that certainly got that memo," Carmichael replies in a quiet tone, now watching Diaval focusedly. "Their ability to travel the battlefields, suggests very strongly that their progenitor had a similar ability. Which would make her a world walker, yes." Diaval nods again and, more to himself than the others present, says, "Yes, that would make sense wouldn't it…" He then paces for a moment, still muttering to himself (the keen eared would hear him talking to himself about his mother and grandmother and the phrase "could they be relatives also?" is clearly heard by Carm's keen ears). He then says, quite formally, "I should introduce myself again then. While I am Jarod Randomson's son, my name is Demario Alyksandr Badhbhchilde Jarodson. My parents called me Mario and my captor gave me the name I have embraced and normally use. My mother, Badhbh Morrigandottr, is the daughter and a high priestess of Scaldcrow Morrigan, the mother of ravens and the patron of warrior women and those who support them." This is something that seems to have been drilled into him in his childhood as it is said both with a straight face and not a single hesitation. The black-feathers ruffle at the introduction, some quiet conversation between one another in touches and a tongue very like primative irish, half heard and half muttered. Carmichael though, nods slow. "I think it is likely," he offers to the relativity of things, pardon the pun. The shortest, squattest of the blackclads merely says: "She who is that which is to come, paints you with destiny. I am of the Black-feather clan, Macha, daughter of Macha-mir, first born and always named, since the first time. Where there is war, we will be. Where Badb moves ahead in herald, we follow up to clean what remains. Always and ever." <Editor's Note>: Carmichael provided this link as an example of how a brightfeathers morrigu would look. Diaval reaches out to take Macha's hand and leans over to kiss the back of it. "Pleasure to meet you, Macha," he says to her and then says, "Odd to find relatives on /that/ side of my family," to Carmichael with a hint of humor in his voice. "Not quite so strange as it might be. Passion and lust go along with warfare. The desire to live life vigorously. Why not?" Carmichael replies, as Macha's hand talons curl over Diaval's fingers as he lifts her hand to his lips to kiss. The short, rather squat morrigu blinks at him, blushes a rare and strange thing amongst these peoples. "It could be worse. You could be stormborn. There's children of the storm all over the multiverse, and they're a dime a dozen in Minos." Diaval releases Macha's hand, not abruptly nor rudely but so that he doesn't extend her embarrassment further. "Yes, we may have some of those back home as well," he observes supporting the idea that they are nearly ubiquitous though Shadow. "As I mentioned earlier I've not been doing much in Amber of late, but I have tried to establish contacts though out the city so I can gather information…" he doesn't ask for anything but obviously he knows of the organization Carmichael has built up. Six of one, half a dozen of the other, to espionage and martial endeavor, for the way the Air-corps work. And within each aspect, there's a good measure of mercy — search and rescue requires first response also, at least in stopping bleeding and also in showing empathy to those within waves or lost within woods. It's a mixed bag. "Good," one word, much impact. "It will serve you well," he looks to the morrigu gathered and speaks in a tongue close to gaelic, which might be understood by Diaval. What can be clear in its interpretation is the Ard-righ; he's asking for 'palace guards' to be formed, a mixed clan wing of perhaps 50 individuals to be gathered. There's intonation of honourific and sacred trusts and such, the diversity of which may or may not be understood. "Meet me for a feast in the dragonspines, next saturday." he instructs. "Very well, Your Highness," Diaval says, acknowledging the invitation before his form blurs and shifts back into raven form. "I will see you then if not sooner," he adds before he and his small flight takes wing.